No larger firm can ignore the demands of innovation – that was the clear message from our most recent roundtable, The law firm of the future, sponsored by LexisNexis Enterprise Solutions. It comes in many forms, predominantly but not just technology, and is not simply a case of automating process. Expertise and process are not mutually exclusive. Some of the points raised were familiar – the danger of simply putting your best lawyer in charge, the changing career expectations of the next generation of lawyers, and questions over whether the current training regime is fit for the future. There were also fundamental issues about the conflict between greater efficiency with billing targets and, ultimately, partners’ take-home pay. Can you persuade your partners that doing work quicker and cheaper than before will benefit them in the long run through more clients? Happily, there is no doubt that the strategies and technologies are out there to help firms compete in this increasingly complex and variegated market. 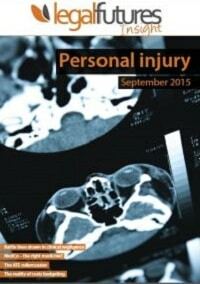 Reading this report will inform your thinking. The working practices of property lawyers have changed little since the 19th century. 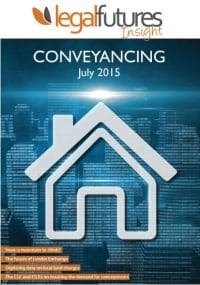 Many aspects of the conveyancing process remain offline – documents are still on paper and the data entered manually. The commercial transaction process is laborious, slow and expensive, and both the client and firm are losing out as a result, a maddening thought in today’s world of digitisation, artificial intelligence (AI) and blockchain. 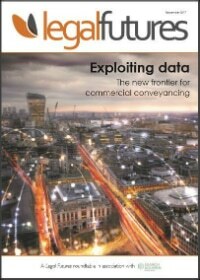 We held a roundtable with Search Acumen to discuss what data means for commercial conveyancing. A discussion that started with the growing sophistication of property searches ended up at a vision of the commercial law firm of the future, shaped and staffed very differently from now. Those who are scared of ideas like blockchain should look away now. In our discussion, Law Society vice-president Christina Blacklaws also emphasised the risk of solicitors not grasping this opportunity – that others will come along to dictate the future, leaving lawyers on the sidelines and part of a vision somebody else is creating. There have been many examples of lawyers not taking the initiative and suffering as a result; maybe here, with a process to which lawyers are so central, there is a chance to reverse this trend. The march of the digital conveyancer continues apace, from the government planning to create the largest repository of open land data in the world, to the rapid adoption of sophisticated technology by conveyancers, such as chatbots and artificial intelligence. So, how does legal regulation keep up with this? In association with the Council for Licensed Conveyancers, we convened a roundtable of industry experts to consider the current state of the market, the changes that technology could bring, and how the regulator should adapt. It was clear from the discussion that the greatest challenge will be to devise a regulatory framework sufficiently flexible that it does not require constant tinkering as the technology continues to develop – regulation has always had the problem of constantly trying to catch up with the market. It has to balance protecting consumers with encouraging innovation for the benefit of those consumers. This is no easy task. 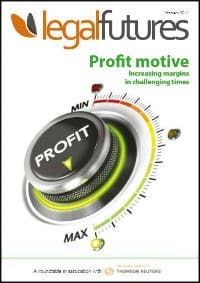 This Legal Futures roundtable report, published in association with Thomson Reuters, looks at what SME law firms are doing to grow their profit margins at a time of economic uncertainty and ever-greater competition. What was so striking about the debate was that despite the very different practices represented around the table, the approach was largely the same. From bespoke property law advice from a traditional partnership to largely automated personal injury work from a limited company, there was more that united our participants than divided them – although the continuing role of the partnership was one of them. Putting a few lawyers around a table invariably produces a stimulating and challenging discussion, and this was no different. There will always be a place for SME law firms, and this roundtable – showcasing their ability to focus, experiment, and succeed – shows how valuable they are to the legal ecosystem. 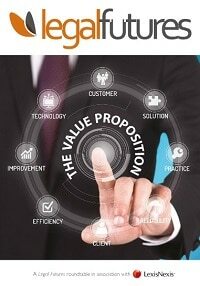 This Legal Futures roundtable report, published in association with LexisNexis, looks at what we call ‘the value proposition’ – how innovative firms have set upon a distinctive path and are ploughing them with vigour and success. We gathered representatives of various firms around the table who show that it is not all about alternative business structures and radical ways of delivering legal services – it can also be about more subtle changes to form and focus that set firms out from the pack. There is, of course, much to treasure in the traditions of the legal profession that have grown up over so many years, but there is equally no reason to preserve them in aspic. We also tackled what LexisNexis’s Bellwether report earlier this year called ‘The riddle of perception’ – which showed that many lawyers do not know their clients quite as well as they think they do. The firms around the table showed that, however, some do. 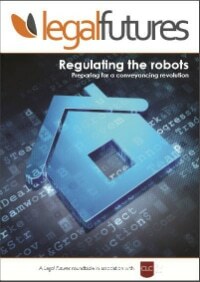 The second issue of Legal Futures Insight explores some of the big changes shaping the future of conveyancing. With award-winning marketing, massive investment and a later than expected launch, Veyo has finally arrived. Leading conveyancers, including the head of a top five firm, the new president of the Law Society and licensed conveyancers myhomemove give their very different reactions. Lender Exchange has been with us for longer, but it is only this year that it has signed up virtually every active conveyancing firm – almost 5,000. Insight 2 finds out whether Lender Exchange, and its smaller rival LMS, will make life simpler, easier and quicker for conveyancers or add to their burdens. Meanwhile we investigate how the Land Registry is trying to drag the world of local land charges into the 21st Century by digitising data traditionally kept by local authorities. Search providers are divided on the issue, with one predicting that “the likelihood of it going smoothly is almost zero”. Meanwhile the property market has been extremely healthy, particularly after the general election. Sheila Kumar, chief executive of the Council for Licensed Conveyancers and Victoria Hurdley from the Chartered Institute of Legal Executives discuss their plans to tackle increasing demand for qualified staff, while responding to the changing market. The first in our quarterly Insight series looks at the regulation of legal services and how it is changing. 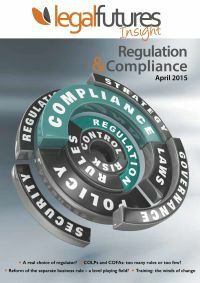 It explores different reactions to four fundamental changes the profession is having to grapple with this year – the end of hours-based professional development, the arrival of a real choice of regulator, changes to the Separate Business Rule and the Solicitors Regulation Authority’s plans to slim down the Accounts Rules and the Code of Conduct. It finds that there is currently no consensus on the best way forward on any of these issues. Some believe solicitors, particularly in small firms, are burdened by too many rules, while other believe a lack of rules will only create huge amounts of guidance. Likewise, the Separate Business Rule has powerful advocates and equally determined opponents. Even on ‘continuing competence’, there is no agreement on whether an hours-based approach is a good or bad thing. Meanwhile, as the number of legal regulators doubles to four, the heads of the Solicitors Regulation Authority, CILEx Regulation, the Bar Standards Board and Council for Licensed Conveyancers set out their stalls, giving us some idea where future battle lines will be drawn. 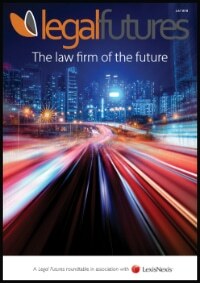 This Legal Futures Special Report, published in association with Thomson Reuters, looks at how SME law firms are driving change in the delivery of legal services. 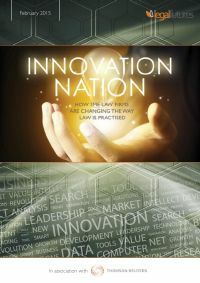 It finds that to some extent innovation is a state of mind, and structure is secondary to how your run your business, but the availability of alternative business structure (ABS) status and the actual or threatened entry of new competition has focused minds, and in some cases becoming an ABS has proved of direct value. The report also highlights the central role technology is having, with firms using it either to improve what is already in place today or to enable the delivery of services in new ways. 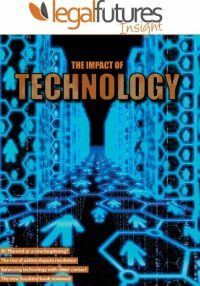 But while there was an acceptance that lawyers have only scratched the surface of what technology has to offer, law remains as much art as science – technology only takes us so far. Where the trends of technology and business structures are pushing us is to focus brains on the real legal work, not the process that can just as efficiently be handled by less-qualified staff or advanced systems.